This page lists the answers to frequently asked questions about the content of the Be a Tree program and technical issues relating to presentations. This FAQ will be of interest to anyone who wants to present the program or book a session. Who created the Be a Tree program and has it undergone peer review? The Be a Tree program was created by Doggone safe founders Joan Orr and Teresa Lewin for Doggone safe . It was upgraded and enhanced in 2017 by Niki Tudge. The original program was developed over a five year period with extensive testing and revision along the way. Many experts have reviewed the program and their input has been incorporated. Reviewers have included professional animal behavior specialists, veterinary behaviorists, general practice veterinarians, dog trainers, elementary school teachers, early childhood education specialists, humane educators, humane society professionals, social workers and mental health professionals. More than 700,000 children have experienced the Be a Tree program, thanks to the hundreds of dedicated presenters worldwide. The Be a Tree program has the support of several veterinary and veterinary technician associations. The Be a Tree program is the only dog bite prevention program to have received the support of several major professional organizations. The Ontario Veterinary Medical Association, the Canadian Association of Animal Health Technologists and Technicians, the Saskatchewan Association of Veterinary Technologists, the Saskatchewan Veterinary Medical Association and the Ontario Association of Veterinary Technicians support the Be a Tree program. Does the material covered in the Be a Tree program fit into the school curriculum? Yes the Be a Tree program fits in with the pets/animals part of most primary school curricula. Suggested follow-up activities that the teacher can use that apply to aspects of math and writing are included with the kit. Panting can be a sign of stress in a dog - why do you tell children that panting dogs are happy? A panting dog is dealing with the stress by panting. A stressed dog that is not panting is much more dangerous because it has no mechanism to relieve the stress and is therefore more likely to react. Not all stress is bad stress. The dog might be waiting for a child to come and say hello. The waiting and wondering causes mild stress and the dog starts to pant. "Are we going for a walk? ", "Are you going to throw that ball? ", "Am I getting the cookie?" These are all circumstances that will cause panting due to mild stress and anticipation. We are trying to keep things simple for children. They obviously cannot be expected to tell the difference between a dog panting under mild stress or a dog panting with rapid frantic breaths that indicates extreme stress (still a dog less likely to bite than a highly stressed dog that is not able to pant). Other things that the children learn during the program should prevent them from interacting with a dog panting out of extreme stress. They are taught to stand sideways and allow the dog to sniff their fist. A very nervous dog is apt to move away and not come forward to sniff - so they would leave that dog alone. They may also see the half moon eye or the fore paw lift and realize that the dog is anxious. They are taught that if the dog stops panting when they approach it, that the dog does not want to meet them. Hopefully, handlers whose dog are very anxious will say no, when a child asks to pet the dog. So for the most part a panting dog is a dog waiting with happy anticipation for something good to happen, or at least is a dog that is dealing with its stress. The panting/not panting differentiation is simple for children and immediately rules out many dogs that they may otherwise have wanted to pet and gives them a way to decide whether their own dog (who is the one most likely to bite them anyway) is open to interaction with them. 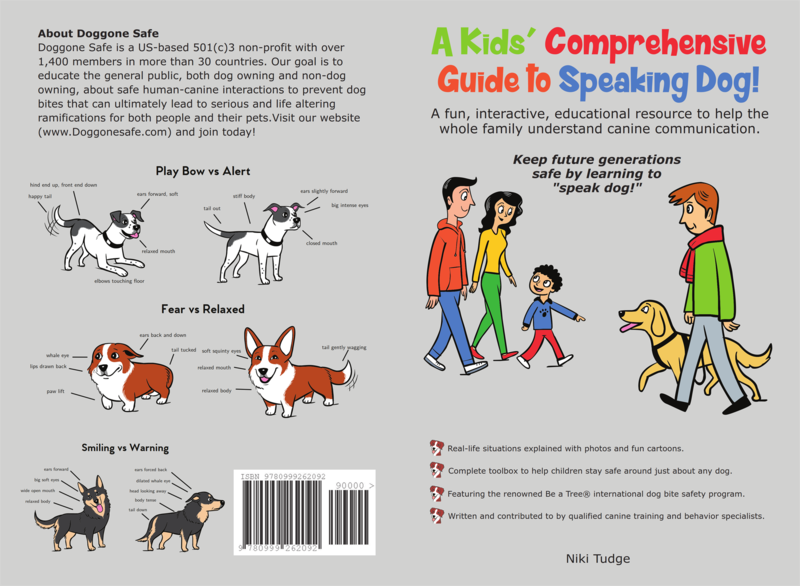 We also teach that children should ask the dog handler to tell the dog to sit before they meet it. The cue "sit" is a stress reliever for most dogs because it is familiar and generally has a positive association and gives the dog some control of the situation. A dog that does not sit for the handler is not under sufficient control for a child to pet. An extremely anxious dog is unlikely to follow instructions and is ruled out on that basis, whether panting or not. Why does Doggone Safe not allow live dogs in Be a Tree presentations given on behalf of the organization by licensed presenters? Live dogs distract the children and the majority of dogs do not enjoy handling by large groups of children. Doggone Safe cannot evaluate the temperament and handling skills of all dogs and handlers that may want to be involved in the program. Even certified therapy dogs, service dogs, guide dogs and dogs that have passed the canine good citizen test are not evaluated for their ability to handle crowds of children or to be petted by many children. Service dogs or guide dogs required by presenters should be placed where they cause the least possible distraction and the children should be told that the dog is working and that they will not be able to pet it. When we started doing dog bite prevention sessions in classrooms we used to take our dogs. These were highly trained and socialized service dogs - Newfoundlands and a German Shepherd. They were very happy to be petted by the first 25-30 children and after that they started yawning or licking their noses or trying to lie down facing away from the children. Since we had just taught the children that a dog showing these signs does not want to be petted, it was contradictory to allow the petting to continue, even though the chance of these dogs actually being stressed enough to bite was neligible. Since most children wanted to meet the dogs, this caused a problem. We also found that many children are distracted by a live dog and they want to look at the dog and ask questions (how much does he eat? how much does he weigh?) that were not relevant to the topic of the presentation. We have discussed this issue with many other experienced bite prevention educators and all agree that live dogs do not have a place in a bite prevention seminar. Delta Society Australia uses a stuffed dog as do others and we are working toward securing funding so that Doggone Safe can also have a stuffed dog that children can practice their skills with. Another reason that Doggone Safe does not allow presenters operating under the Doggone Safe name to take live dogs into the classroom is that there is no way to evaluate the dogs or the handling skills of the presenter. Even certified service and therapy dogs handled by professional dog trainers and behaviourists will show signs of anxiety and stress when large groups of children are allowed to pet them and so it is better if the dogs are not subjected to this. The classroom is not the place for people to show off how nice their dog is, or how nice their breed is. Surrounding a dog with children sets the dog up to fail. If dogs are taken into the classroom as part of another presentation separate from Doggone Safe, we recommend that this be done as a demonstration only (grooming, tricks, obedience, service work etc) and that the children be allowed to watch but not to interact with the dog. This will avoid any chance of a dog reacting and hurting a child, will avoid stress to the dog and will avoid giving the children contraditory messages. We know that many people do not agree with us on this issue, but we feel very strongly and we will not be convinced otherwise. My dog is a certified Therapy Dog and I have liability insurance through the therapy dog organization - surely this dog is allowed in Be a Tree presentations? This is probably our most frequently asked question of all. The same answer applies as to the previous question. It is a rare dog that genuinely enjoys the attention of a large group of children. Even therapy dogs are not conditioned for this nor tested for their ability to tolerate this type of situation. If I am not a licensed presenter can I take a Therapy Dog into a Be a Tree presentation? I know all about the [therapy dog organization] and the wonderful work that they do. It is not a matter of insurance that we do not allow dogs with licensed presenters. Signing the license agreement is optional. 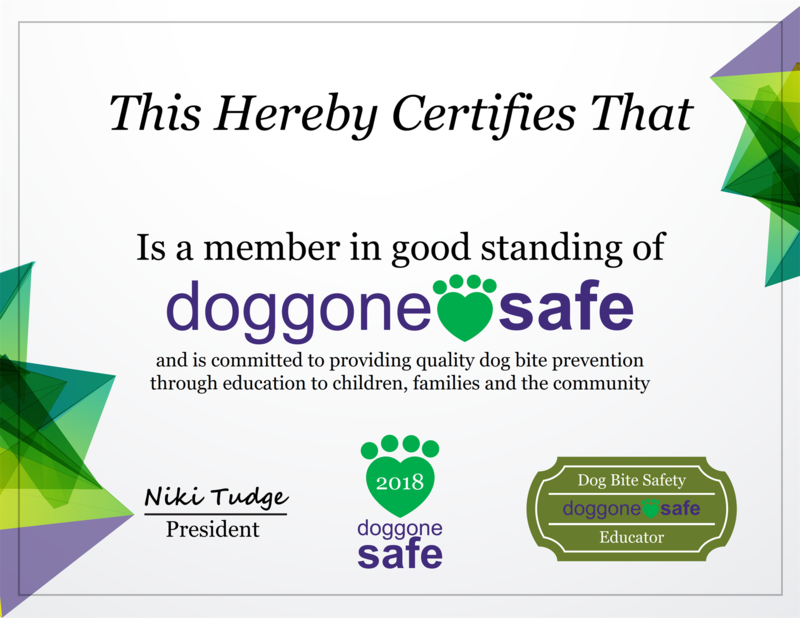 Licensed presenters can use the Be a Tree logo to help promote the program and their business, can present on behalf of Doggone Safe and are eligible for help from us in gaining sponsorship if such an opportunity should arise. You can use the kit and do Be a Tree presentations without becoming licensed. Therapy dogs are generally not conditioned to enjoy the attention of large groups of children. Of course they are unlikely to bite, but it is almost inevitable that some if not all of them will start to show signs of anxiety after being petted by a number of children. We noticed this with our own highly tolerant, child loving service dogs that we used to take into classrooms. After a time they would start to yawn or lick their chops or turn away. We had just taught the children that they should respect a dog and leave him alone when he gives these signals and yet here we were allowing the petting to continue. It is very unfair to the children to prevent the rest of them form meeting the dogs after some have already had a chance. It was also wrong to contradict the messages we had just taught. The only solution was to leave the dogs out. The dogs are also a big distraction for the children. We found we got much better attention from the children and also we could have much more fun with the noisy games without the dogs present. We found that the dogs were certainly not an essential part of teaching about bite prevention and were in fact a detriment to our specific goal. So these are the main reasons for not having a dog. It is not that we think that a dog might bite or that people do or do have insurance. What we suggest to presenters that want to bring dogs into the classroom is that they do the Be a Tree program without the dog present. After the presentation is over they bring in the dogs to do a demonstration of whatever the dog's job is and let the children observe and ask questions. There is no interaction between the dogs and kids. This has worked well for many people. This approach would not contravene the license agreement. If you want to have all or some of the children pet the dogs that is up to you (as an unlicensed presenter). Please observe carefully and see whether the dogs show any of the signs of stress that you teach the children about. If not, then great, if so, then you can decide whether you really should be having the dogs there. Some rare dogs do enjoy meeting lots of children, but most do not - even certified therapy dogs. The therapy work that they are certified for generally involves one-on-one types of interactions and not groups of noisy excited children, many of whom will not pet properly even after instruction. I can't tell you how many times we have had this discussion with therapy dog handlers. Many of them after observing their dogs closely realized that the dogs were in fact not enjoying the interaction and decided to make the dog part of the session an observation rather than a participation part. If you wish to be a licensed presenter then you would sign the agreement that precludes taking a dog into the presentation. If you do not wish to be a licensed presenter then you may do as you judge to be suitable with respect to the dogs. Thank you for asking for clarification on this. I hope that you and the children enjoy the program. Please don't hesitate to email or call if you have any further questions. I remember during one of our presentations that Joan and I attended with our service dogs and my dog groaned. I will never forget it. The dog (Blucher who is in the be a tree teacher kit) was relaxing, he stretched out his body and as his front forelegs extended, he Groaned! Oh my goodness the children were all instant little trees! It wasn't the dogs intention to scare the children, he only groaned, however, Joan and I both were hard pressed to get into a discussion with little children as to what is a dog groan and what is a growl. It's way too much information for the time we had to allotted to do a presentation with children. There were other behaviours our dogs would present (most all of the displacement behaviours) which is fabulous in that, the dogs were dealing with the stress of the children and staying in one place, however, it became to contradictive with respect to the message were trying to convey to the children. As you know, there is only so much information they can retain in any given short period of time. If we could visit the classroom once a week, or everyday for the whole entire semester, then perhaps the children could be exposed to more information about dog behaviour. :) Anyway, suffice to say this all occurred while Joan and I were doing research for the program - Be a Tree. Since we don't bring the dogs with us for the be a tree program we reduce the risk that we would get a 'no' based solely on the fact that some school boards do not allow dogs or any animals on the school property. Thanks again [questioner] for your wonderful work. The questioner replied this way (see below), and we appreciate her willingness to consider our reasons for not allowing licensed Doggone Safe presenters to bring dogs into the classroom. We know that this indicates a dedication to teaching about bite prevention. I thank you so much for getting back to me and clarifying your position. I am having several meetings with the Humane Society and will bring your email. This is a really good topic for discussion. I really appreciate your willingness to help us with this process and your information and advice are invaluable in helping us develop our program. Why do you tell children to fold their hands and look at their feet in the tree position? Folding their hands gives the children something to do with them and makes them less likely to put their hands up. Some dog bite prevention programs advise putting hands in pockets and backing away (child could trip), or folding hands across the chest. Bringing hands up towards the face like this brings the attention of the dog up towards the face. Keeping hands low keeps dog's head low. Here is a series of photos that illustrates this. The movement of the hands upward attracts the dog to move closer and investigate the hands. The dog's head tends to follow the hands. A smaller dog might even jump to check out the hands. This puts the dogs teeth closer to the throat and face. We have tested many tree configurations with kids and friendly dogs and overly excited puppies and the less movement the better. We suggest that children watch their roots grow (look at their feet). This gives them something to look at other than the dog. It gives them a positive image to focus on (roots growing). We also tell them to count in their head to the highest number they know, over and over until help comes or the dog goes away. This gives them something to do with their minds while they are frightened. We have tested looking at feet versus looking ahead with groups of adults. Everyone reported that it is easier not to look at the dog while focusing on your own feet. Every person admitted to sneaking a peek at the dog while trying to look ahead, but not if they were looking at their feet. Children respond much better to specific instructions such as "look at your feet". There is no interpretation involved with this and it is easy to remember. "Look ahead" and "look at something in the distance" or "look up to the sky" are too non-specific and require judgment. In a high stress situation, the less judgment a child needs exercise the better. Someone suggested to us that it is better for the child to look ahead (but not at the dog) so that they will know when the dog is gone. So we tested this also. Even with your head down a person can see at least 40 feet ahead and to the side, certainly far enough to be able to know if the dog is still in the immediate area. Try it yourself. I was told to try to block the dog with a book or knapsack if attacked. Why is this not in your program script? Some dog bite prevention educators do suggest this. We stress that if the child stands still and quiet the dog will most likely go away eventually and may come close, but is unlikely to attack if they are still. The movement of holding out the knapsack or book may be threatening enough to trigger a bite that would not have otherwise happened. We have had many stories of the tree working even with a moving and pushy dog. Movement is a major trigger and even trying to block with a knapsack etc may backfire since the kids are moving, probably looking at the dog and acting like victims. Some people suggest that if a dog is coming fast and looks aggressive and there is time, then trying to feed it a book or knapsack may be a good idea. But then what? If they move away at that point the dog will most likely leave the object and chase them. If they stay still then the dog may lose interest in the object and approach them again. So there is not much difference here from just standing still in the first place. What if the dog was not intent on biting, but the child thought it was and the object enraged or excited the dog? A bite could be provoked that would not otherwise have happened. Unfortunately if a dog is really intent on attack there is really nothing a child can do to prevent it. This is a rare situation and most dogs do not want to attack. If the dog is predatory, then standing still is the least interesting thing to the dog. If the dog is aggressive then standing still is the least threatening thing to the dog. No-one has tested this with children in a real-life situation for ethical and safety reasons. We have seen a mock situation in a video in which a child is holding a knapsack and backing away while the dog jumps and barks at him. In this scene the dog does not back off and in fact appears to be getting more excited. There is no evidence that backing away and holding out the knapsack is discouraging the dog from attacking. In this particular situation the child could trip and fall backwards while walking backwards which would almost certainly trigger an attack. We like to keep it simple and stick to the be a tree message, because it really is the most likely thing that will save the child's life and does not require any decision making in a time of extreme stress. Your program does not talk much about dog bites to the children - why is this? The Be a Tree program is designed to prevent the situations that lead to bites. The program uses mostly positive messages and does not intend to frighten children by talking about dogs that might bite them. The program gives children the tools they need to evaluate what the dog is thinking and decide whether that dog wants to meet them. We prefer to have them thinking in terms of whether the dog wants to meet them, rather than whether the dog is likely to bite them. The program teaches them to interact only with happy receptive dogs in appropriate ways under adult supervision. They learn more about what they should look for and what they should do as opposed to what they should not do. Some of the program content seems too advanced for younger children - what age is the program aimed at? The Be a Tree program is ideal for children in grades 2-3 and is suitable for up to grade 5 and for younger children as well. The program has been tested with junior kindergarten up to grade 5. Individual presenters can gauge the level of the audience and adapt the level of detail accordingly. We have used the program with veterinary students and college level veterinary technician students to teach about dog behavior and even they learned a lot from it. We are conducting an ongoing survey of teachers and will discover what they think about the age appropriateness of the program. We will make recommendations to presenters based on this feedback when it is available. The program was reviewed by several elementary school teachers and early childhood educators to ensure that the content and level of detail is appropriate. Why do you ask that the dog be sitting before the child pets the dog? A dog that is not under sufficient handler control to sit on cue is not reliable enough to be petted by a child. This is a very easy way for a child to make a judgment and rules out a great many dogs with a simple step. Perhaps when enough children begin enforcing this rule, dog owners will become more diligent in teaching good manners to their dogs. This idea was suggested to us by Summer Epinger of D.A.F.E.Y. (Dog Awareness for Everyone Including Youth). Why do you ask the child to allow the dog to sniff their fist in greeting the dog? Is is an important social aspect of dog culture to sniff in greeting. Dogs that are suddenly touched will naturally turn to see who is there and may even snap if surprised. Many dog bite prevention programs recommend offering a fist rather than a flat hand. One reason for this is that a fist can be less threatening since if the dog has been hit, it is more likely that the owner uses and flat hand rather than a fist to discipline the dog. Another reason is that little fingers can be mistaken for treats, especially if they smell tasty. The most important reason is that if the dog does bite, there is less likelihood of serious damage and no chance of having a finger bitten off. The child should not stick his fist into the dogs face, but rather hold his fist loosely at his side and be close enough that the dog can lean forward to sniff. The dog is given the opportunity to initiate the interaction. Why do you recommend that the child scratch the dog on the side of the neck? Most dogs enjoy a scratch on the side of the neck. This does not involve the child's hand coming over the dog's head and keeps the child's face away from the dog's face. Some bite prevention programs suggest that the child should pet the dog on its back. We have tested this method (with adults) and have found that this can startle the dog causing it to turn toward the child. With a large dog and a small child this results in face to face interaction. Even if the dog already knows someone is there it most often turns its head toward the source of the touch. Many dogs find a hand on the back to be a threatening gesture and try to move away. Some turn and snap without fully investigating the reason for the pressure on their back. When is it safe for the child to leave the Tree position after an encounter with a dog? When the dog has lost interest and moved away or when help comes and the dog has been secured. If the child is in doubt they should maintain the tree position. If the child moves and the dog resumes interest then the child should be a tree again. Does Being a Tree work in a real-life situation? Will children remember to do this? We have had several reports from parents of children (and even adults) being a tree in a real life situation. Yes they remember to do it if they have practiced it!